345 Five Pounds O'Brien. B277 (2) E29 161223 and E29 161228. Last series. Scarce. UNC. 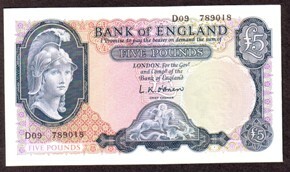 155 Five Pounds Helmeted Britannia issue (4) O'Brien, B277 1957, C32 four consecutive numbers. AEF.